British Airways is the largest carrier in the UK, with its head office located near Heathrow. Their second largest hub is located in Gatwick. British Airways is affectionately known as the “World’s Favorite Airline”. One of the largest airlines, British Airways are known for the diversity they bring to customers with their service, and ample selection of flying routes. They have been around since shortly after World War 1, during the birth of air travel as we know it in 1919. The company’s firm stance in the global marketplace, and on the World Exchange, help to ensure customers that they have nothing but a good experience to gain by choosing British Airways, one of the oldest of international airlines. British Airways puts you “First” with their first class service. First class customers are first to get on the plane, and off. They make sure you move seamlessly through airport security, offer you airport lounge facilities, exclusive access to the Concorde Room at London Heathrow Terminal 5. With “First” you are offered private pre-flight dining, along with champagne, access to boardroom facilities, free internet, luxurious customer cabanas, and treatment at the Elmis Travel Spa. Global concierge services are standard in destinations across the world, to make sure you get where you’re going in a timely manner. British Airways First Class service also offer you extra luggage, with 5 pieces of luggage (32kg each), on each of their available routes at no extra charge. Customers can also carry their handbags, briefcases, or laptops on board. Pets, or other approved animals fly in specially designated areas on the plane, to ensure they arrive as safe as you do. British Airlines First Class also entitles you to cabins that are 60% larger than other classes, full flat beds with Egyptian woven cotton sheets, complimentary pajamas, turn down services, relaxing in-room lighting, access to 50 movies & music CD’s, champagne, five star dining, and to top it all off an on board pharmacy with many natural health products. British Airway are always striving to improve their service, to meet demanding customer needs. Your feedback will be requested, and welcomed with open arms – the same way they will make you feel before you step on board the plane! You have many options when booking your business class travel with British Airways. You can use their booking portal online, and have a virtual assistant help you along the way. It is always recommended however, to seek out a licensed travel agent, to assure no problems arise throughout your trip. 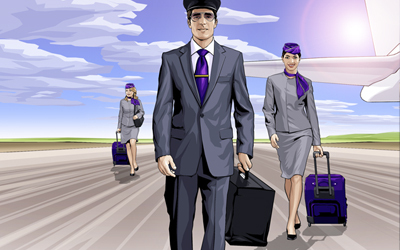 Travel agents can provide a smooth trip from land, to air. They have the knowledge to find out about special requirements, insurance needs, and make sure all bookings are confirmed, so you are not left on the ground when flight plans changed unnoticed, or when bookings were not taken care of on time.